If you ordered to personalization, please include the name here you would like to add and the name of the font option from the last photo in the listing (Nick, Matt, Kate or Sarah). If you didn't order it, please enter n/a. Thanks! The "Skinny" case measures approximately 3 1/2"wide x 7" tall. It will hold 2 EpiPens® alone. Another option would be to remove an expired EpiPen® from its shell and fill it with antihistamine liquid pods. Then put an EpiPen® and pods in the Skinny case. It is recommended to always have two EpiPens® available so, please make sure to keep a backup EpiPen® close if you chose the later option. This case is also perfectly sized for one Diastat® or two Glucagon® Pens. The cases are made from Sunbrella® outdoor canvas and dimpled sport material with a YKK® zipper opening. They come with a webbing loop on top so that it can be attached to a backpack or belt loop with a carabiner clip (not included). Many people choose to tuck them in a pocket, purse, backpack or school binder. Whatever works best for you or your loved one to keep EpiPens® immediately accessible. 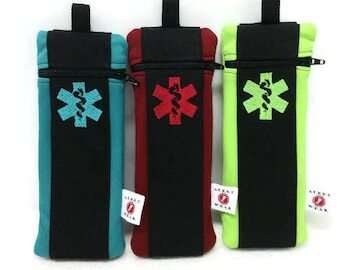 The case comes with medical alert symbol (and name if applicable) embroidered on the front in the color(s) of your choice. 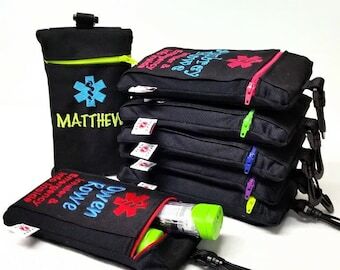 If you order the case with an alert and a name (or initials or other word), please add a comment with the name, preferred color(s) for the name and which font you would prefer (see pictures for options: Matt, Nick, Kate or Sarah font). Please note that the space is limited and ideally should be less than 7 letters. You must approve the mock ups that we will send you prior to production. *Please note, an ICE panel (In Case of Emergency) that we make for other cases will NOT fit in these cases. AUVI-Q®, EpiPens®, YKK®,Diastat®, Glucagon® and Sunbrella® are registered trademarks for the medicines and materials that these cases are made for or with and are not affiliated with Alert Wear. Medicines and props in images are not included. 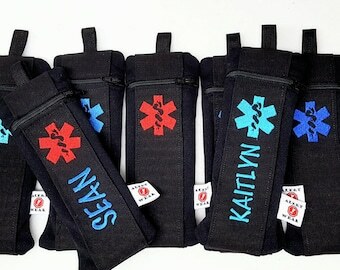 This design and title, Epi Skinny, EpiSkinny or Skinny Case are exclusive copyrighted designs and wording of Alert Wear. Copyright 2006-2019. All rights reserved. Wow, awesome, love my new Epipen case! Such high quality. Ann was also great in sending me pics of different color options to help me make up my mind, and my case was customized exactly the way I wanted. I've had to carry Epipens for about 40 years, I so wish this company would've been around when I was a kid but still happy to have found it now and will recommend to everybody! Wow; the best medical carrying case I have ever found! Very durable and perfectly sized. 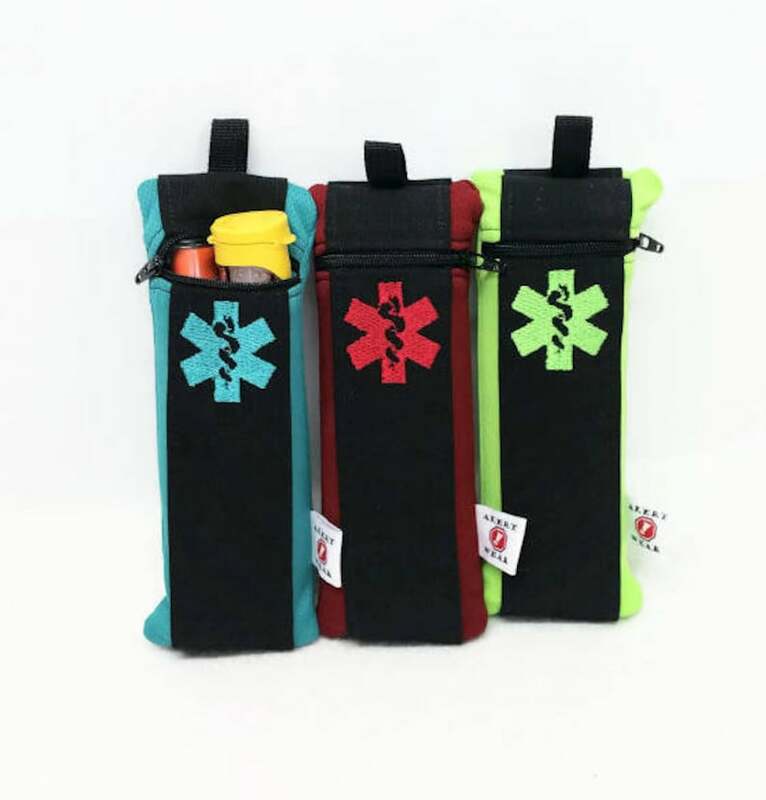 Holds an epi pen pack or 3 standard pens for insulin, etc. I plan to order another for my backup supply. Wonderful shop. Truly a pleasure to do business with in every way. Thank you so much!